What to do if you find a baby wild animal? The best thing you can do is contact a licensed rehabilitator. They are trained to take care of wildlife. For a list of licensed rehabilitators contact the Nature Center (410-535-5327 during business hours). Do not bring animals to the Nature Center; staff are not trained or licensed to take care of abandoned or injured wildlife. MYTH: If you touch a young animal the mother will abandon it. FACT: Wild animal mothers will risk their own lives to save their babies and will not reject them based on human scent alone. Most birds don’t even have a sense of smell. Keep your cats indoors and watch dogs carefully to make sure they don't inadvertently harm wildlife. Most baby birds do not need to be rescued. Contact a rehabilitator before you try to rescue an animal. What should you do with a bird out of the nest? Watch it from a distance for an hour to make sure the adult birds return to feed the chick. The parent birds are usually nearby ready to feed and protect their baby. What if a bird builds a nest in an inconvenient place, like the barbecue grill? The birds have built the nest in a place they consider safe, and they will abandon that nest if it is moved to a different site. Wait patiently until the birds have successfully fledged. Then you can seal up or move the grill to prevent a second nest from being built. Put up birdhouses close to the spot. Mammal, like rabbits and squirrels, have more than one litter in a year and offspring are independent at a fairly young age. If its eyes are open and it is up and out and moving around, it can be on its own; remember, keep your pets, especially cats, indoors. If you do find a baby mammal with its eyes closed, do not rescue the babies until you are certain it is abandoned. Mammals often feed their young only a few times a day, so absence of an adult does not mean it is abandoned. Contact a rehabilitator before you try to rescue an animal. As soon as turtles hatch they can make it on their own. They do not need our care in any way. You can release the hatchling in a stream or pond near where you found it. 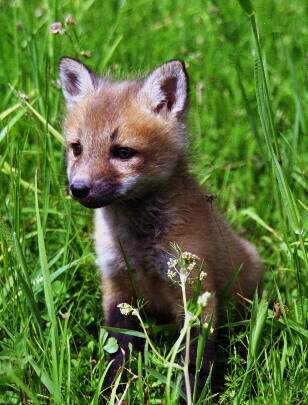 If you’re worried that a fox will eat an animal you don’t rescue, remember that fox babies need to eat too!